Music is an important part of a daily routine for most people. It brings rest, relaxation and focus. In movies it is a large part to bring the suspence and to bring atmosphere. A good set of speakers is a therefore a must. Is the Logitech MX sound a viable option? 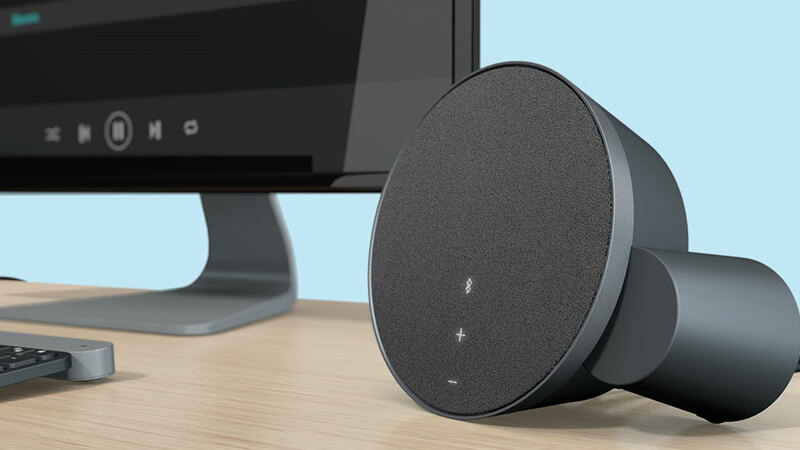 The MX sound are the latest generation speakers of Logitech. When you take them out of the box you get 2 black, sleak speakers and cables to connect them (3.5 mm jack) and a power cable. You will notice, when you take them out of the box, that there are not buttons or dials on the speakers itself, also you will notice that in the design they put a large L and R marked into them, so you know for sure how they should go on your desk, or wherever you want to put them. For many this will be a silly thing to point out, but it is helpful for many of us. They are even noticable with bad eyesight. No buttons or dials? How do you work with it? How do you raise the volume? In the right speaker there are pushbuttons marked by lights (which light up when you wave in front of them). They go out after a while (thanks to the power saving technology). You have 3 of these light up buttons. Two to control the volume, and one to connect with bluetooth. Bluetooth? Indeed. These speakers have bluetooth 4.1 technology installed and can be onnected with up to 3 devices (2 through bluetooth and 1 with the 3.5 milimeter jack). Thanks to the Logitech Easy Switch technology you can switch between playing with different devices. Thanks to the 3.5 mm jack you can play these on most common devices, even those that don’t use bluetooth technology. It is not a surround set, so probably not so good for the movie-buffs amongst us. This is a great set to set on your desktop to be used as desktop speakers and to connect your mp3 player or smartphone. If you are thinking of passing this by because of soundquailty? Don’t. This set has a very decent sound and play bass up to a decent level (not so that your desk starts to shiver. The volume is also loud enough so you can play music for the whole appartment, not just for you alone, in front of them. These are not speakers to be used on tommorowland, but for home-use they are certainly awesome. If I was in the market for a good set of speakers, I would certainly buy these, as they give good value for money and will let you enjoy your music for years to come. ← soldering: what do you need? I’m responding about music itself if that’s alright. I don’t know if I’m autistic, undiagnosed and tough to get a dx late in the US. I’ve had a good kind of obsession for 2 years now, the singer/songwriter in The La’s, from the UK. The blond singer is different, but he’s been unfairly labeled crazy, lost and most ignorantly “idiot savant.” In one song he writes “no one listens anyway” about his life. So I decided, ok I’m going to listen. To try to understand him after reading all his interviews I determined he could well be autistic. Will not label him and am writing here to keep this private. If interested, check his lyrics and vocalizations, perhaps a kind of stimming: https://www.youtube.com/watch?v=FswF_rTlkrY This song Timeless Melody if full of autistic experience, how music helps him cope. Or else similar to how some autistic people experience music.